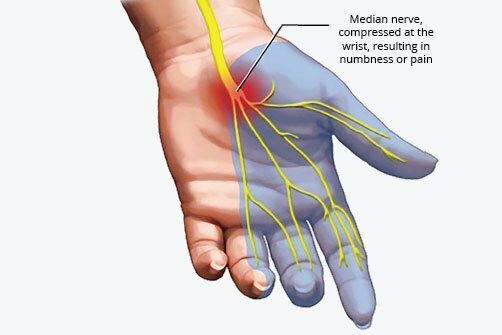 In the evolutionary world where computer or laptop is every day gadget ergonomic design is the need of an era. 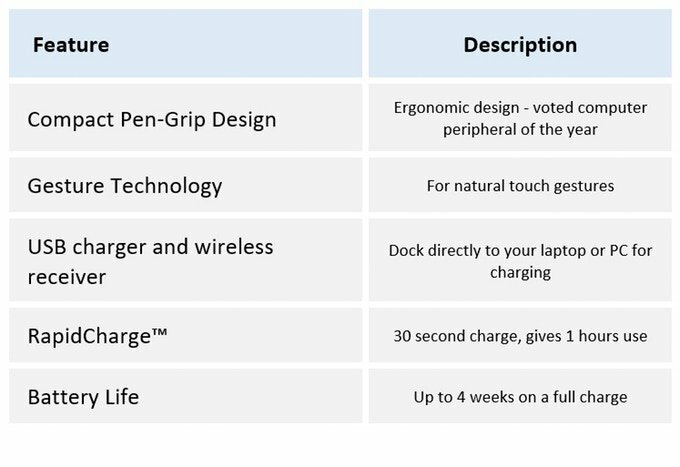 Swiftpoint, a technology development company, has introduced the award-winning pen-grip mouse and presenter. It is best designed for designers, power users, can use in the office or when you are traveling or enjoying coffee. While using a mouse you might have faced the discomfort and annoying experience after long use of a conventional mouse. When we call health our first priority we should mean it. It is an ultimate travel mouse can be used when you are working on the sofa, in a cafe, at the airport, on the plane, bus or train. Likewise, it works best on an iPad to remote into a Mac or PC with full mouse control. 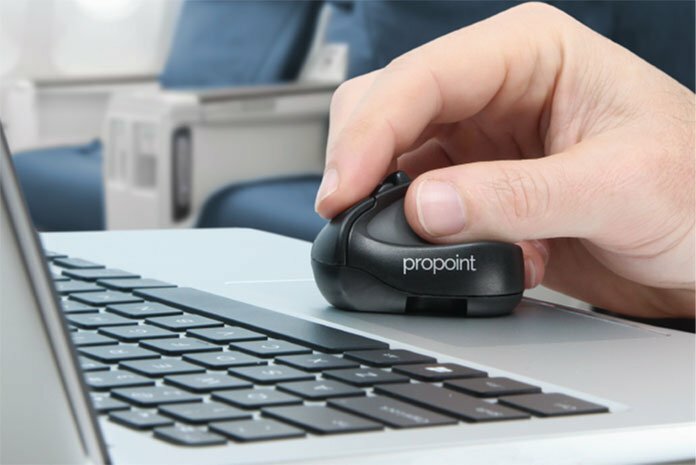 Amazingly designed ergonomic pen grip proves ProPoint the most comfortable mouse on the market. In-air presenter stands tall and controls your presentation also. One more exceptional feature of ProPoint, use hand gestures to draw on the screen. It perfect tool for power users and designers. This is the world’s only mouse which has tilt gestures for scrolling, zooming and rotating. It works best on the most used software such as Word or Excel, Photoshop or CAD. It can be used anywhere when on the sofa, in a cafe or even on your laptop palm rest. If you are planning to move away closing your laptop simply attach your Propoint to a magnetic parking spot on the lid. You can later operate your laptop through ProPoint. You can connect via Bluetooth or with the USB receiver. The same USB receiver also can be utilized to charge the mouse. 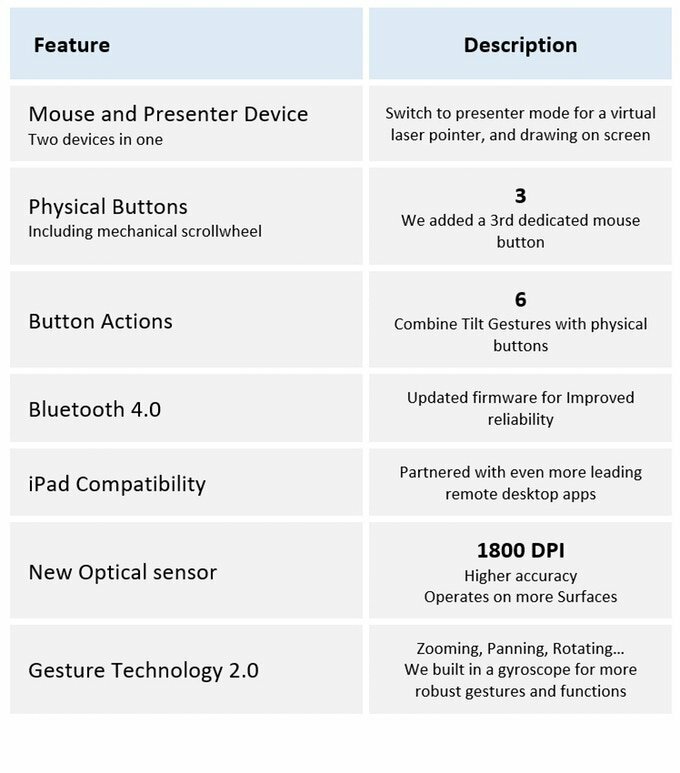 ProPoint is not merely the most comfortable mouse in the world, but also a presenter. Since it is devised with gyro technology, it works as your companion on your presentions. Simply, it is two devices in one. You can now slide and lead your audience through your presentation with the virtual laser pointer. Likewise, it enables you to draw on the screen to highlight the important things. In addition to this, ProPoint works on your iPad. It is devised with a wireless receiver and also supports Bluetooth. Hence, it works on your desktop, laptop, tablet, iPad, or even your phone. It has proven amazing gadget with exceptional functionalities such as one is a three-button mouse and scroll wheel. With devised gyroscope technology it enables tilt gestures to lead the new world for panning, zooming, and rotation. The conventional mouse uses the scroll wheel for a middle mouse click. whereas, ProPoint has a third dedicated button for this function. It made simple to assign individual functions to all three buttons when the device is tilted. So, there is actually total six button actions. According to your accessibility, you can assign shortcuts to the tilt gestures such as app switching and the actions you use the most. It is compatible with office programs such as Word and Excel, design programs like Photoshop and Illustrator and 3D modeling programs. Where it is utilized flick up/down or even left/right click to the area you need to work on without pressing any button and can effortlessly rotate, zoom and pan. A device can be used regardless of the place, and comfort to use your laptop or computer. It is used on small spaces such as your laptop palm-rest. It is ultra light and small in size. Provides full functions of a conventional mouse, even more, better with its minimalist style.